The most ambitious artificial brain yet designed is taking shape in a laboratory in Colorado. The brain's developers aim to link it to a robot kitten called Robokoneko, which they hope will become one of the first superstars of artificial life. "Observers won't need a PhD to appreciate that there is a brain behind it," says Hugo de Garis of Advanced Telecommunications Research in Kyoto, Japan, the brain's principal architect. De Garis's Cellular Automata Machine (CAM) brain is being built under contract by Genobyte, a company in Boulder, Colorado. It will contain nearly 40 million artificial neurons, compared with the few hundred neurons that most other specialists in artificial intelligence are working with. The CAM brain differs not only in its immense scale, but also in the fact that its neurons are real electronic devices rather than software simulations. The CAM brain uses a special type of computer chip called a field programmable gate array (FPGA). Unlike conventional chips, the circuits in FPGAs can be reconfigured by altering the connections between their transistors. When de Garis conceived his project six years ago it was greeted with skepticism. "Many of my colleagues thought I was nuts," he says. But it has now become a practical proposition with the development of a new and exceptionally robust FPGA made by Xilinx, a company in San Jose, California. The CAM brain will run on 72 linked FPGAs. At any one time these devices will act as a "module" containing 1152 interconnected neurons. But the devices will be repeatedly reconfigured to represent 32 768 different modules. The brain remembers how the modules connect to each other (see Diagram), and uses the outputs of the modules it has already processed as inputs for others. 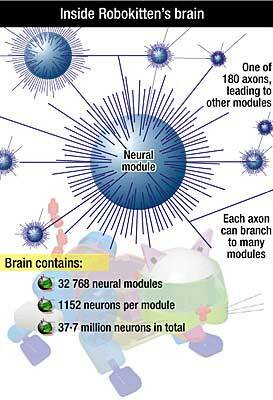 A cycle through these modules, representing 37.7 million neurons, will be repeated 300 times every second. To model the brain, de Garis uses some 450 million autonomous "cells" representing components such as the neurons themselves and the axons and dendrites that connect them. Each cell consists of several transistors within an FPGA. Neural networks must be fine-tuned to perform particular tasks. But no human programmer could write the software needed to refine a network as complex as the CAM brain. Instead, this will be generated using an approach that simulates biological evolution. Through random mutations and breeding of the "genetic material" that describes the structure and connections of the network, the program will be evolved over many generations to get the optimum design. Robokoneko will not be built until this work has been completed on a computer simulation of the robot cat. Some experts, however, doubt whether building ever bigger neural networks will bring any fundamental insights into the mysteries of cognition, such as how the brain builds a representation of the world. "The point is that these puzzles are not puzzles because our neural models are not large enough," argues Igor Aleksander, a neural systems engineer at Imperial College London. The CAM brain's developers admit that they can't predict exactly how it will perform when it is linked to Robokoneko. But they hope it will for the first time allow a robot to interact with stimuli in its environment to develop the sort of intelligence seen in animals. "What is so special about this neural network is a much higher degree of biological relevance," says Michael Korkin of Genobyte.